Students often learn just one piece of grammar in a lesson. Most of them master that day’s subject and move on to the next. But, when the time for revision comes, they often don’t remember what they’ve learnt. For example, two weeks ago my class encountered an exercise in which several tenses were revised. First, they demanded that I re-explain the grammar and then they seemed really confused about what form they should use. That was why I decided to stop there and prepare several exercises and a clear mind map. You can find them here. There are two different mind maps in this post. 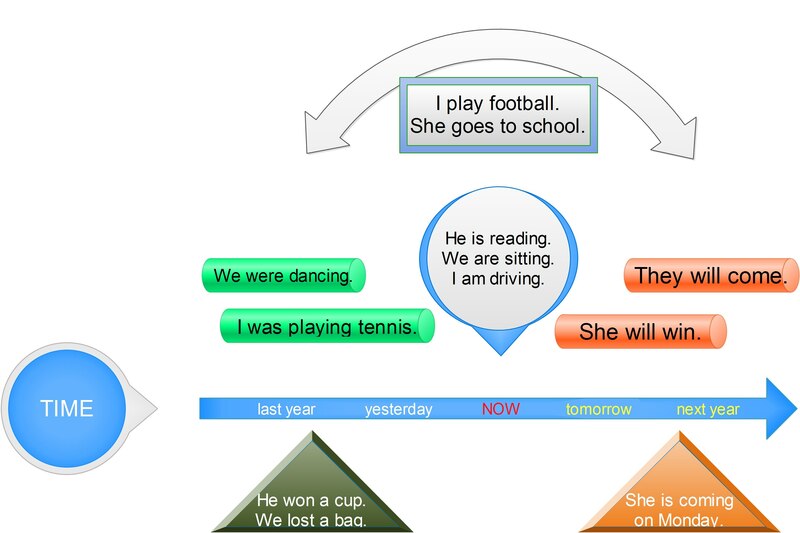 The first one shows when different tenses should be used. 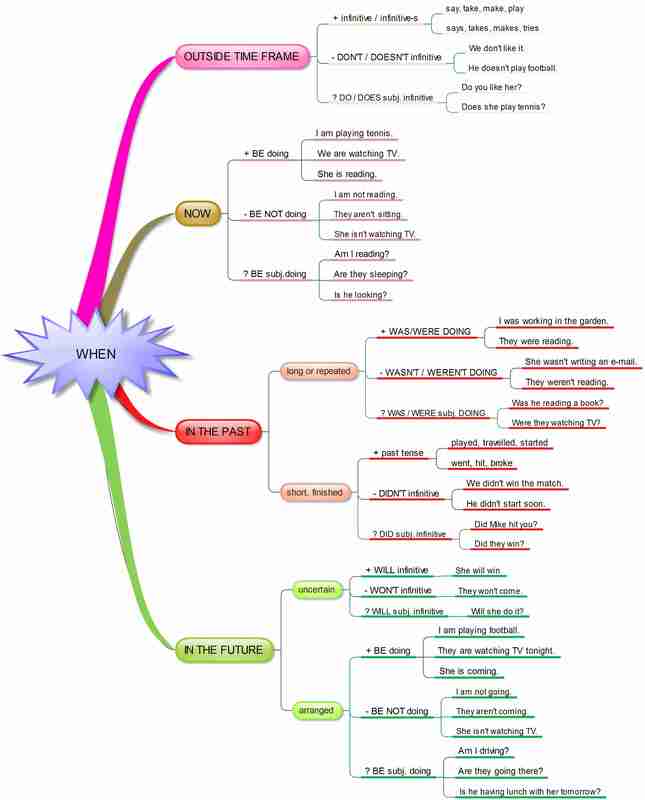 If you decide to use this mind map, you will have to explain the grammar yourselves. The second infographic is much more detailed. You will have to explain this one to your students as well. You have to emphasize that they first have to ask when the action happens. Does it happen NOW, IN THE FUTURE, IN THE PAST or ALL THE TIME? Once they answer that question, they should follow the appropriate branch. If the action happens in the past, they have to decide if the action was a long one or a short one and then use the appropriate tense. If the action happens in the future, they have to decide how certain the action is and then use the appropriate form. Promises and predictions are considered uncertain. Now that your students understand the grammar, they have to use it as soon as possible. Allow them to use the infographic here. The following online quiz is in HTML5, so your students can try it out on their mobile phones while you do it on the interactive whiteboard. The quiz has two parts. You will get to play a game after each part if you pass. If you cannot do the exercise online, you can try the following paper version of the quiz. You can find more exercises to practise different tenses at Five Tenses and Five Tenses additional exercises.